Our Puerto Chiapas cruise port guide gives you information about the docking location, cruise dock, transportation options and much more! 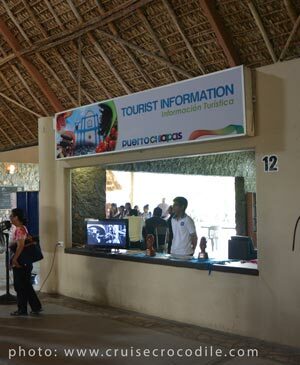 Welcome to the Puerto Chiapas cruise port guide. Puerto Chiapas is a small port on the Southern West coast of Mexico. It is the gateway to Mexican state Chiapas where you can find various interesting cities and tourist sites. This is the perfect opportunity to get acquainted with the history and cultivation of coffee, bananas and cocoa. There are several plantations you can visit in the area. Puerto Chiapas is also the port from where you can visit the city of Tapachula. This historic town offers lovely museums and shops with local produce. Check out the Puerto Chiapas cruise port guide underneath to plan your day ashore. When your cruise ship is docked at Puerto Chiapas you will have this view from the deck over the cruise terminal. You will find the cruise facility building in front of the dock. Inside you will find a local band, several souvenir shops and a tourist information point. 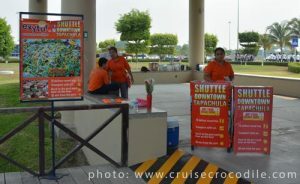 You will also find a taxi information desk in front of the cruise welcome center. There is also a bar and pool right at the cruise dock. Cruise ships dock a the cruise terminal of Puerto Chiapas. The cruise terminal lies within the commercial port of Puerto Chiapas. A separate section is devoted to the arrival of cruise ships. From the cruise dock you walk straight into the cruise welcome centre / cruise terminal. In the welcome centre you will find tourist information, several shops, wi-fi and a stage for local performers. 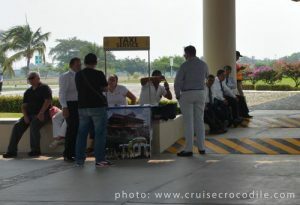 When you walk out of the cruise terminal you will find the taxi association desk where you can hire a taxi. Make sure to negotiate a price before you step into the taxi. 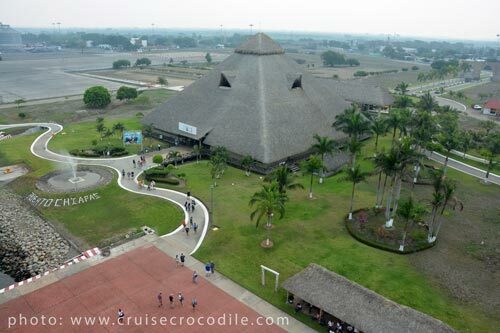 At the cruise terminal you will also find a shuttle service to Tapachula, which is a historic city about 30 minutes drive from the cruise dock. Pay 10 US dollars for a round trip ticket. Just on the other side of the cruise terminal is also where you will find a local tour desk. 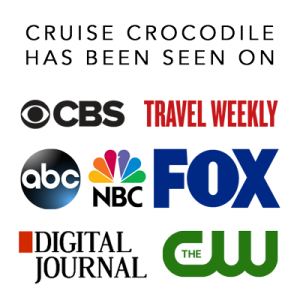 They have a few tours leaving when a cruise ship is in port. There is no beach within walkin distance of the Puerto Chiapas cruise terminal. You will, however, find a Palapa restaurant at the dock that has a swimming pool, beer and music. For those wanting to have a easy day in port, why not stay here? Tapachula is the nearest city that offers a great historical town influenced by the Mayans, Mestizos, Spaniards, German, Chinese and French. Find it 30 km / 18 miles north of Puerto Chiapas. Tuxtla Chico For the chocoholics: this is the mandatory stop in Puerto Chiapas. Get to learn how chocolate is made and sample various specialties of the area. Find it 42 km / 26 miles north of Puerto Chiapas. Agrovia Estate Coffee is the most popular drink on earth. Learn more about this beautiful product at one of the oldest coffee producers in the region. Find it 84 km / 52 miles north of Puerto Chiapas. Izapa Ruins The Izapa Ruins is home of the Mayan Calendar. This archeological site was the centre of commercial trade in the area. Find it near Tapachula. Find it 40 km / 25 miles north of Puerto Chiapas. 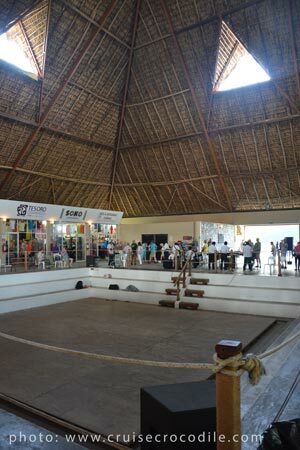 The cruise terminal of Puerto Chiapas offers great facilities like souvenir shops, tourist information and performances. 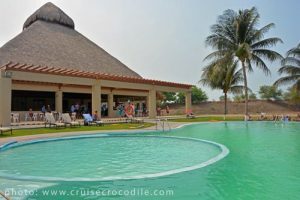 Read the full Puerto Chiapas cruise port guide for all the information.